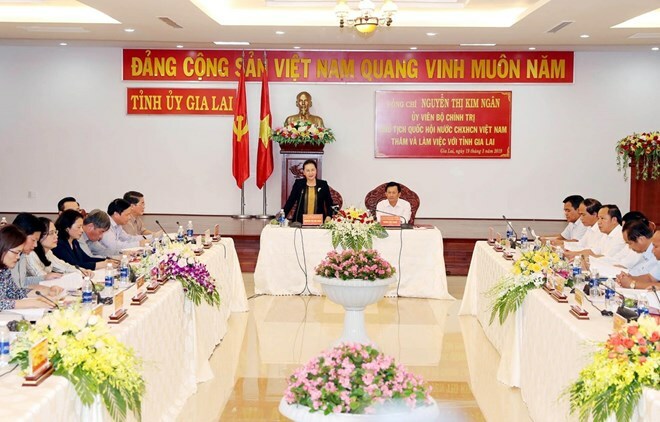 Gia Lai (VNA) – Chairwoman of the National Assembly Nguyen Thi Kim Ngan has hailed the Central Highlands province of Gia Lai for its good socio-economic performance in 2018, particularly a growth rate of 8 percent, during a working session with the province’s senior officials on March 19. The NA leader noted that the province’s per capita Gross Regional Domestic Product in 2018 came to 45.36 million VND, higher than the figures of other ocalities in the region, and the household poverty rate dropped to 10.04 percent. She also recognised Gia Lai’s efforts in building new rural areas, with 60 out of the total 184 communes having earned the new-style rural area title.